On October 6, 2007, the Fredericksburg Area Museum and Cultural Center, 907 Princess Anne Street, opened a retrospective exhibit of the paintings of Fredericksburg artist John Adams Elder, "Fredericksburg's Artist of the Civil War." The retrospective exhibit, the first of Elder's work since 1947, included portraits, landscapes, and paintings of the Civil War and Southern life. It was on view until September 7, 2008. In addition to these, there was displayed a portrait of a horse named War Song and some personal memorabilia including a straw pipe, an artillery shell, and the photograph of the artist and his friends. John Adams "Jack" Elder, son of a shoemaker, was born on February 3, 1833, at the family home, 1111 Caroline Street. His artistic talent was evident at an early age. When he was only seven years old, he painted a decorative screen for his mother. At the school of Messrs. Sterns and Hamsley, he filled his copy books with caricatures of his teachers and companions. He used pieces of coal to carve heads in the style of cameos. His mother, the former Mary Phillips of Winchester, had artists in her family. She was delighted with her son's talent and managed to provide money for some art materials. However, his father, John Douglas Elder, discouraged what he considered his son's impractical bent. But his father could not discourage young Jack. If he lacked a brush he made it from the housemaid's hair. He used the fences of Fredericksburg as canvases to paint the faces of local citizens. Wealthy old lawyer John Minor recognized most of the faces. Known for his somewhat eccentric philanthropies, Mr. Minor became young Jack's patron. Thanks to Mr. Minor, by at age seventeen John Elder was the pupil of Daniel Huntington in New York City. His first portrait there depicted one of the Vanderbilts. Next Mr. Minor persuaded painter Emanuel Leutze of Washington Crossing the Delaware fame to take Jack with him when he returned to teach at the famous school of art in Dusseldorf, Germany. There the young artist studied for five years and won the academy prize. For an unknown reason, Elder declined a trip to Rome which was part of the prize. Back home in Fredericksburg, he painted portraits of area citizens in his one-room studio of the old Exchange Hotel at the corner of Caroline and Hanover Streets. One of his portrait subjects was Jane Hipkins Dickenson Yerby, an ancestress of Elizabeth Pavlansky Butler of Fredericksburg. Mrs. Yerby's father, William I. Dickenson of "Chestnut Valley" in Caroline County was one of the early patrons of Elder who painted two portraits of him. In the early morning of December 18, 1857, Jack's Exchange Hotel studio was destroyed by a fire which began on the floor above. By daylight, only the Exchange's brick walls remained. The local newspaper considered it a stroke of luck that the "admirable" portrait of John Tayloe Lomax which Elder had painted for the Young Men's Christian Society had been removed some days before. John Elder next established a studio in the Valentine Building at Broad and 9th Streets in Richmond. During the early days of the Civil War, he was an artist for Southern Punch magazine. He was in Fredericksburg the morning of December 11, 1862, when Federal troops began their shelling of the town. A shell hit outside the Elder home at 1111 Caroline Street and set Jack's bed on fire. Luckily he had been visiting a friend that night. "I hope you will have all my things well packed sent to me immediately as I have nothing...but those I brought away on my back...I could rent a room reasonably cheap but unfurnished. I was thinking if it would not be a good idea to have a few things from my room sent down here and go regular to batcholing. I am sure I could cook a cup of coffee of mornings but then comes the dinner, that's the rub...Every thing is tremendously high. In fact I am afraid people will have to pay for smelling before long." The cost at a restaurant for a plate of soup and one veal cutlet was five dollars. "I could do nothing but pay for it...I am still at work at the Arsenal as draughtsman. I think I might do something if I had a room and all my paints in Richmond. Now don't fail to send me every thing down as soon as possible for I am kept back by your neglect in sending my trunk. "I am employed in the office from 9 until 3 o'clock & the rest of the day I am idle & longing to hear how & what you have been doing since the great battle. I hope the grand old building [1111 Caroline Street] is still standing and you all have not been frightened out of your wits of growth...You may soon look out for another great battle there or in the neighborhood...a greatest number of troops going up to Fre s burg more than I have ever seen to so look out." Years later, in another letter from Mrs. Van Swaringen's collection, Elder's close friend, Major Raleigh Travers "Trav" Daniel, recalls that Elder was a member of Caskie's Battery of Artillery at the Battle of the Crater before Petersburg. "And the next day," Trav Daniel wrote, "he made sketches of the topography and military positions of the scene." The large painting Elder made from these sketches was on display at Woodhouse & Parham Bookstore in Richmond but was destroyed by the fire which swept the city in 1865. Also destroyed was the first copy of his Scout's Prize. Elder repeated both on larger canvases They were purchased on the easel by Confederate General William Mahone and have a permanent home in the Commonwealth Club in Richmond. An October 16, 1929 clipping from a local newspaper tells the story of his Lee at Appomattox: John Elder was at Appomattox and sought to convey his exact impression of General Lee as he came back from his interview with General Grant. Elder worked on it for years but it was still unfinished when he was paralyzed during his last years. It was on display in 1929 in the Fredericksburg Elks Hall when the United Daughters of the Confederacy entertained the Robert E. Lee Foundation. It may have been one of the paintings remaining at 1111 Caroline Street for years after Elder's death. 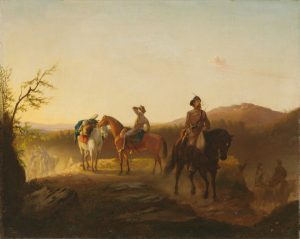 After serving the Confederacy until Robert E. Lee's surrender at Appomattox, John Elder exchanged his rifle for his artist's brush. In 1866 his painting of a wounded Confederate soldier leaning on the arm of his beautiful sister was on display in the art room of Davies' Musical Exchange in Richmond. 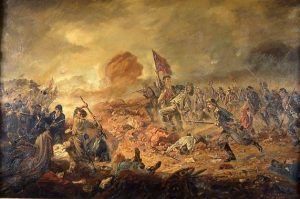 Soon after, William Wilson Corcoran came to Richmond to buy The Battle of the Crater for his gallery in Washington, but General Mahone beat him to it. However, Mr. Corcoran made the best of it and ordered 3/4 portraits of Lee and Jackson and sat for a portrait by Elder. John Elder painted eight portraits of Robert E. Lee. He painted the Confederacy's heroes and battles, governors and other major Virginia officials and scenes of life in old Virginia. Both Atlanta and Savannah commissioned portraits of Lee. The Richmond letters he carried with him to Atlanta described him as "Captain Jack...our artist, the artist of Va. & `one of ours.'" "I have nothing to complain of," wrote Jack Elder to his friend, sculptor Edward Valentine who was in Paris. Elder settled down to serious painting, with many commissions for portraits. His Richmond studio was a meeting place for fellow artists and other friends. Another friend was sculptor Caspar Buberl who wrote to thank "Dear Friend Elder" for the plaster head of a statuette and to invite him and their mutual friend Trav to New York for the holy days of Christmas 1875. Caspar was a native of Bohemia, and his sculptures would range from a "colossal group for the National Museum in Washington, D. C.", to his final work, a statue of Confederate Admiral Raphael Semmes. Cartoonist Thomas Nast came to Richmond in 1881. 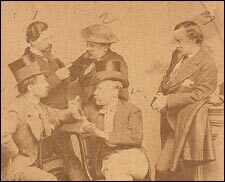 He joined Jack Elder, Trav Daniel, artist William Ludwell "Willie" Sheppard and a Mr. Wellford for a convivial photograph. It's the only known photograph of John Elder. The final destination of the Elder letters, photographs and clippings was 1111 Caroline Street, where they were preserved through the early decades of the 20th century. They are an important part of the Van Swaringen Collection. Today only an 1877 photograph of a beautiful girl gives a glimpse of John Elder's sweetheart. She was Miss Fisher, a Richmond Belle whom an Elder biographer says the artist did not marry because he did not feel he could support her in the manner to which she was accustomed. He never married; the portrait he painted of Miss Fisher was hanging in his room when he died. Romance aside, Jack Elder continued to paint. On March 22, 1884, the United States adjutant wrote General Fitzhugh Lee that he was sending John A. Elder in Richmond "copies of such papers relative to the Custer massacre as may be useful to a painter." The result was the panoramic Battle of the Rosebud or Custer's Last Charge. It was shown in the Virginia exhibit at an 1885 exposition in New Orleans and called "a great painting...an apotheosis of American courage." But within decades, the Custer painting disappeared from view. In 1987, Mrs. Barbara Pratt Willis, who was in charge of the Virginiana Room of the Headquarters Branch, Central Rappahannock Regional Library, found that it was in the possession of the New York State Division of Military and Naval Affairs and was on display on the fourth floor of their Latham, New York, headquarters. Another famous Elder painting, Appomattox has hung in the Virginia State Library in Richmond, along with his portraits of governors, judges, and other distinguished Virginians. Appomattox depicts a Confederate soldier viewing the field of strife after the surrender. 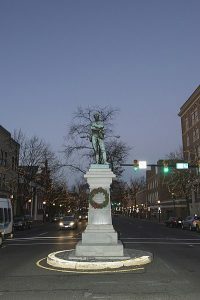 John Elder modeled the bronze figure erected at the corner of Washington and Prince Streets in Alexandria from the soldier in Appomattox, commemorating the city's Confederate dead. Caspar Buberl helped him carry out the project. It was unveiled on May 24, 1889. In 1887 Elder had spent a month at Beauvoir, Jefferson Davis' Mississippi home where he painted a full-length portrait of the Confederate president who he greatly esteemed. However, the artist's visit to Beauvoir had an unfortunate result: Elder contracted malaria and was never well again. It was time to go home to Fredericksburg and 1111 Caroline Street. His health gradually failed, and he died at 2 o'clock morning of February 24, 1895, in the same house where he was born. "The day of his funeral," Fredericksburg historian Robert A. Hodge wrote, "had a chilling wind which moaned in the leafless branches of the trees. Among the monuments in the Fredericksburg Confederate Cemetery were piled white drifts of the storm just passed. 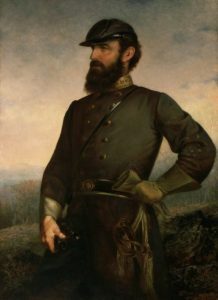 That day it was said the name of John Elder would be as immortal in his native city as his portraits of Lee and Davis." A simple monument marks his grave. The inscription: John Elder Artist. He was well remembered. Trav Daniel wrote a biography for the Corcoran. In 1947 the Virginia Museum of Fine Arts held a retrospective exhibit with 52 Elder paintings. However, some have fallen through the cracks of time. Thirty-five years after John Elder's death the Free Lance-Star noted: "In the old brick house at 1111 Main (Caroline) Street where Elder was born and lived for years, are scattered remnants of Elder's work which are of great value." There, in the possession of his Williams relatives, were his sketchbooks, many small color sketches and paintings, drawings for Custer's Last Charge and perhaps his last sketch of Jefferson Davis. An old letter indicates that statuettes were made of the Alexandria monument. Miss Katy (Mary Catherine Williams) was the last surviving niece, and her 1939 will bequeathed a bust of Stonewall Jackson to the Jackson Shrine at Guinea Station. Her will also mentioned an ebony and silver walking stick which could have belonged to her Uncle John. John Elder's portrait of his sweetheart, only known as Miss Fisher, has never been found. It was described in 1929 as "a simple study of a natural pretty girl in soft colors." We do know that it was with him when he died. John "Jack" Elder's life story took on an added dimension in 1994 when Fredericksburg native Doris Butler Van Swaringen presented a collection of Elder's letters, photographs, sketches and other memorabilia to the Museum. The collection was housed in an old Miller & Rhoads Department Store box, another relic of Virginia's past. It came to Mrs. Van Swaringen from her late brother-in-law, W. F. Van Swaringen, who obtained it many years ago from the estate of John Elder's last surviving niece, Mary Catherine "Miss Katy" Williams. Doris Butler Van Swaringen and her late brothers, Jack and Roy Butler, grew up at 1109 Caroline Street, next door to the Elder/Williams home at 1111 Caroline Street. They would often glimpse John Elder's niece, white-haired Miss Katy. Mrs. Van Swaringen, who lives in Davidsville, Maryland, is a genealogist and historian. She is an original member of the Surratt Society. For years she directed the costuming, oversaw the furnishing, trained docents, and was chairman of special events at the Mary Surratt House in Clinton, Maryland. Editor's note: Although this exhibition took place more than a decade ago, Mr. Elder's work is still of great interest. In 2017, his Appomattox statue in Alexandria was added to the state register of historic places.